You know what can make me do the Happy Dance? When I can cook something pretty and then serve it on something pretty. Win-Nguyen in my book. So when our generous friends at Nambé gave me the chance to create something to showcase their beautiful Fish Platter, I jumped at the opportunity! I love making whole fish—it retains a lot of moisture and I believe, often enhances the flavor of the fish. 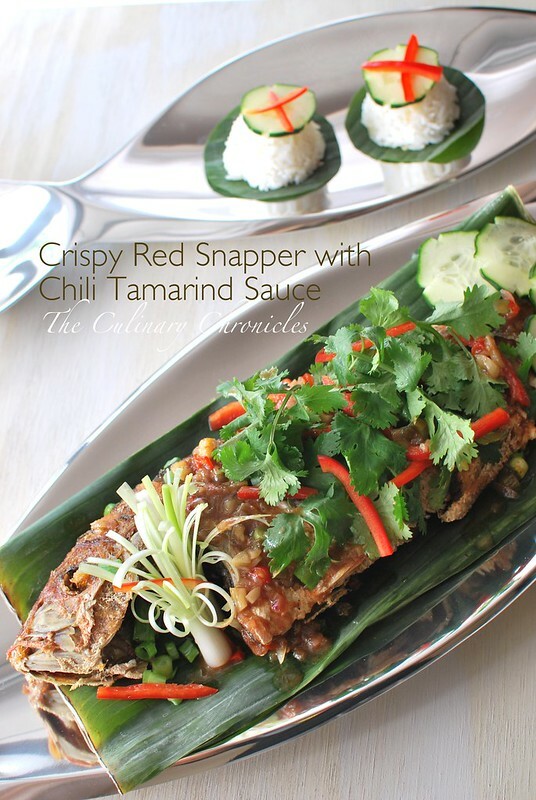 I opted to drizzle this crispy red snapper with a sweet and sour tamarind chili sauce—and trust me, you will LOVE the flavor and texture balance. And guess what? 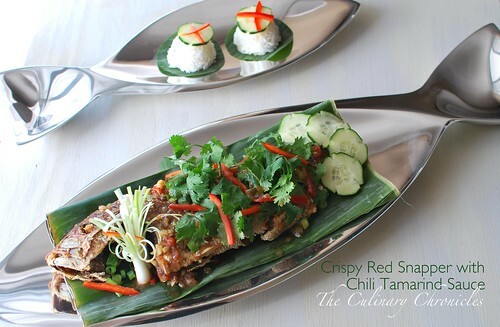 Not only can you make this Crispy Red Snapper but you will also have the opportunity to win the stunning Fish Platter! Woo Hoo! The deadline to enter is Sunday, July 22nd at 5pm (PST) and the winner will be announced the next day. Best of luck friends and THANKS so much Nambé! In a sauce pan, heat the vegetable oil and sauté the shallots and garlic for 2 minutes until fragrant but not browned. Add in the chili peppers and cook for an additional minute. Add the tamarind juice concentrate, palm sugar, fish sauce and water. Continue cooking over medium-low heat while stirring until all the sugar has dissolved. Lower the heat and gently simmer until the sauce has thickened. Taste the sauce and adjust with the desired level of sweetness or heat by adding more chili peppers, palm sugar or tamarind juice concentrate. While the sauce is reducing, rinse the fish with cool water and pat dry with paper towels. Score both sides of the fish about every 1½ inches. Fill a heavy bottom pot or wok with oil deep enough to submerge your fish. Heat the oil to 350 degrees F and carefully slide the fish into the oil. Fry the fish until golden brown—about 3-4 minutes per side. Remove the fish from the oil and drain on a cooling rack that has been placed on top of a sheet pan. Allow to drain for 1-2 minutes before transferring to a serving dish. Cover the crispy fish with scallions, red bell pepper and drizzle the sauce all over the top. Add the fresh cilantro and serve immediately with steamed rice. Next Post Breakfast Pizza + Nambé Giveaway WINNER! That looks lovely, and it’s bursting with some of my favorite sour, spicy and complex flavors. Thanks for sharing. I would serve Fried catfish in it as we love catfish. Rainbow trout from my husband’s fishing, of course! This platter is beautiful! I’m subscribed to your site! I’m a fan of Nambe on fb as well! I would probably serve scallop skewers on this platter! I like Nambe on facebook too. My husband likes to make tilapia, we’d love to use the fish platter to serve it on! I would make tuna steaks in an asian marinade (spices, oj, soy sauce). 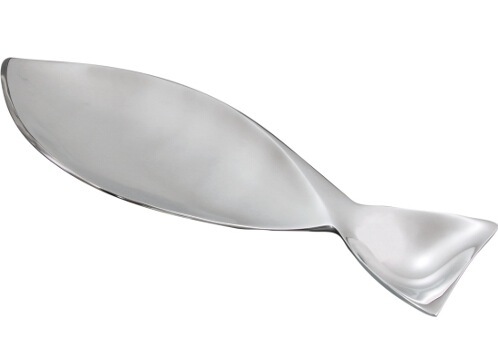 How cute would this be serving sushi?? I’d make a fish filet with yuchoy & shitake mushroom dish, and serve it on that cute platter! I would have to do a grilled salmon filet with lemon butter sauce! And I already like the culinary chronicles! I would make barbecue salmon to serve on the beautiful platter. Great website that I’ve been subscribing to for awhile, and have tried lots of the posted recipes. And, by the way, what’s palm sugar? Thanks! Love this website, and have been enjoying the creative recipes that keep cooking fun for me. I would serve Gambas al Ajillo (shrimp with garlic)! I liked the Nambe facebook page! I liked the Culinary Chronicles on facebook! I would serve sushi using this platter! I’ve subscribed to The Culinary Chronicles! I “liked” the Nambe Facebook page. I “liked” The Culinary Chronicles on Facebook. I’m following @CulinaryChron on Twitter. gurl… i would make copper river salmon. AND I follow you on the twitters. This is a gorgeous fish platter. First thing I would serve would be a rainbow trout that roasted whole with lemon and herbs. It’s going to be wonderful on this platter. The first thing I’d serve is fresh rainbow trout- yum! Yummmmmmmmm!!!!!! My neighbour caught some small bream and trevally today and gave them to us so I made this dish with a few tweaks – I had leftover fresh shallots but no fried so added these to the sauce with a stalk of lemongrass. No Thai basil either (waiting for my plant to re-sprout) but lots of coriander from the garden. It was amazing – my 11 yo daughter was saying “no fish! !” but we convinced her to try it and she LOVED IT!! We all did – the sauce was a perfect balance of sweet and salty, fruity and sour. We served it with rice, showed our kids how to lift the fish off the bones and it was a winner!! Can’t wait to try it again.